One of the lasting successes of the Articles Congress was the reorganization of western territories. The Treaty of Paris had not just given the colonies their independence; it relinquished British claims on North America (with the exception of Bermuda and Tobago). This meant the countless acres of land between the Appalachians and the Mississippi River was suddenly wide open. However, the various states laid peculiar claims on the lands to the Mississippi River. For example, Virginia claimed everything between the Ohio River and Lake Superior as its own “Illinois County” due to the success of a Virginia militia expedition into this far western region during the Revolutionary War. Quebec, New York and Massachusetts all laid claim to Upper Canada, a vague region north of the Great Lakes where water flows into the Lakes as opposed to Hudson’s Bay. Quebec also claimed everything from its definite borders to the confluence of the Ohio and Mississippi Rivers based on the 1774 Quebec Act . Rupert’s Land, the ceded massive arctic territory formerly owned by the Hudson’s Bay Company, was also in dispute . Georgia, North Carolina, South Carolina, Connecticut and Newfoundland had their own claims in the midst of this mess. Also in the middle of this tangle were nearly 100,000 Indians, thousands of traders and a constant stream of settlers pushing across the Appalachians. The controversy even included the Caribbean where Grenada and St. Vincent feuded over who controlled the tiny Grenadines Archipelago that lie between those two islands. Starting in 1780, the states began ceding their western claims to the Articles Congress. 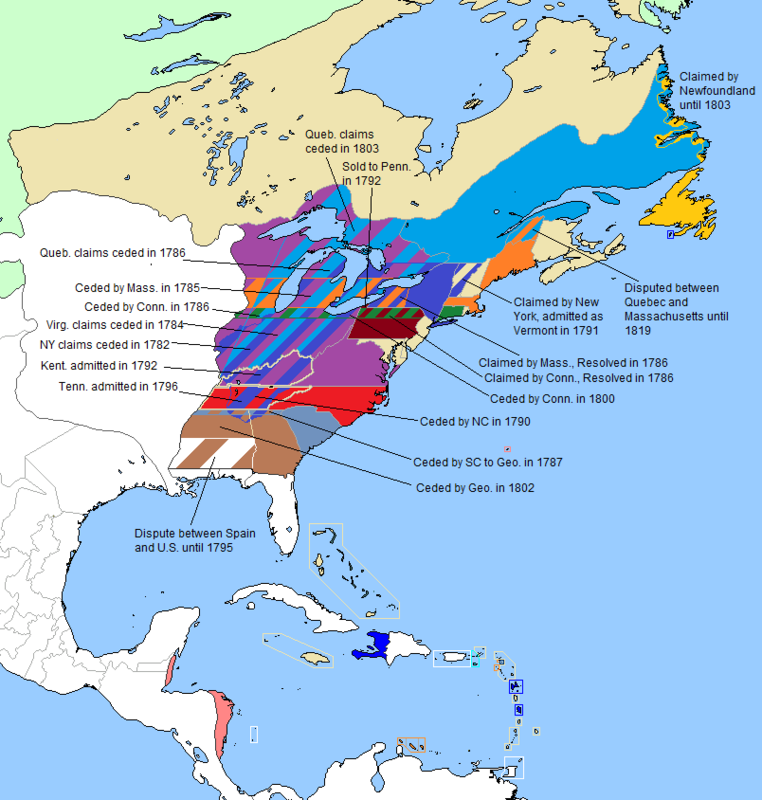 New York relinquished its massive claims in 1782 followed by Virginia in 1784 and Quebec in 1786. Massachusetts ceded its weak claims in 1785 followed by Connecticut in 1786. A narrow claim of land from the northwest corner of South Carolina to the Mississippi River was ceded from South Carolina to Georgia in 1787. North Carolina ceded its western counties, what would become Tennessee, in 1790. Quebec wouldn’t cede its claims on Upper Canada until 1803. Even then, that cessation came with its own provisions. The Labrador Coast was disputed between Quebec and Newfoundland, though Quebec had the stronger claim dating back to colonial surveys and charters. To appease Quebec in the cessation of Upper Canada, Congress firmly awarded Labrador to Quebec. To appease the disgruntled Newfoundlanders, the recently acquired French islands of St. Pierre and Miquelon (and their valuable fisheries) were added as a county to Newfoundland instead of becoming a separate territory or state. Virginia never really ceded its claim to parts of Kentucky even as Kentucky gained its own statehood in 1792. Connecticut and Virginia held special agreements to land reserves in what would become Ohio as a way to compensate revolutionary war veterans with promises of land made a decade before. Nova Scotia, Massachusetts and Quebec disputed the northern boundaries of what would become Maine until 1819 . Vermont, despite claims from New York, had essentially governed itself since 1777. It wouldn’t be until 1790 that the New York Legislature consented to repealing the claims and negotiating with the Vermonters. Boundaries were agreed upon and Vermont became the first non-original state admitted to the union in 1791 . Excerpt from Barack Obama’s “A Brief Review of Judicial Authority In Territorial Dispute Resolution”, Harvard Law Review, Vol. 104, 1990. Grenada claimed that the 1763 Treaty of Paris held as the most recent territorial precedent which the Court should uphold since both islands could cite mountains of confusing treaties and charters that occurred over the centuries of imperial island swapping. Writing for the majority, Chief Justice Oliver Ellsworth laid out a decision that would later prove critical to determining boundary disputes between states where no compact could be reached and legal precedent relied on foreign charters and various peace treaties. In the case, the Court laid out one of its first multi-factor approaches to dispute resolution. The Court would first determine if Congress had resolved the territorial dispute in a treaty with the relinquishing foreign power (not the case here as the 1782 Treaty of Paris merely granted “Grenada,…St. Vincent” their independence with no mention of the Grenadines). Secondly, the Court would review and decide on any state agreements or compacts that had been concluded before the submission of a petition to the Court. Thirdly, the Court would “examine all prior treaties, charters and pertinent territorial decisions and precedents in order to deliver an equitable solution.” Since neither of the first prongs of decision making applied, the Court dove into a lengthy examination of multiple charters for both St. Vincent and Grenada, gave deference to Grenada’s long standing administrative authority over the populated islands of Carriacou and Petit Martinique, and found that the most recent authoritative territorial decision had come from the 1763 Treaty of Paris. The final decision was largely in favor of Grenada, though the Court recognized standing administrative precedent for St. Vincent over the nearby islands of Bequia and Mustique. Therefore, the Grenadine chain divided into a northern half and a southern half which would go to St. Vincent and Grenada respectively with the dividing line centered on the channel between Savan Island and Canouan. Not only is the case remembered for being the first exercise of original jurisdiction in matters of controversy between the states but it laid out the Grenadines Test and demonstrated that the court was not afraid to make binding territorial decisions when diplomats and politicians failed to resolve such disputes. Some disputes were international. The border between the western counties of Georgia and Spanish West Florida wouldn’t be settled until 1795. Spanish and American claims to the Kabetogama region  and the far western reaches of Rupert’s Land Territory and Spanish Louisiana were also disputed, though the territories themselves so remote that conflict was never a threat. As these cessations of claims continued throughout the 1780’s, the Articles Congress passed the Land Ordinance of 1784. The brainchild of Thomas Jefferson, this ordinance declared that new states should be created from the ceded land, those states would have the same status as the original state and they would have a Republican form of government. Jefferson further penned the 1785 Land Ordinance which put in mechanisms for selling and settling these lands. A public land survey system was established whereby the land would be surveyed into square townships of six miles on each side. The townships were subdivided into 36 sections of one square mile each. Section 16 of each township would be reserved for the maintenance of public schools. Ordinances in 1787 and 1789 cemented these policy ideas but also creating the concept of territorial governments and prohibiting slavery north of the Ohio River. These organizations were significant in setting up new states, surveying territory and facilitating settlement. Of course, settlement over the Appalachians had been occurring for decades. Since before the Revolutionary War, pioneers had violated British treaties and pushed into Ohio Country. These illicit settlements almost immediately sparked conflict with natives. By the time Washington took office, the Western Lakes Confederacy had been warring with American settlers for years. This Confederacy was comprised of tribes such as the Council of Three Fires (also known as the United Nations of Chippewa, Ottawa, and Potawatomi Indians), the Iroquois Confederacy, Mohawk, Abenaki, Huron, Onondaga, the various Wabash tribes, the Illini Confederacy, Wyandot, Mississaugas, Shawnee, Lenape, Miami, Kickapoo, Kaskaskia, Lower Cherokee and Upper Muscogee. Ranging from the St. Lawrence Valley to the Spanish frontier, this was a formidable alliance, even if non-centralized, that opposed American settlement. The Northwest Indian War was, in a way, a continuation of the scattered western theater of the American Revolutionary War. The Treaty of Paris does not mention anything about Indians on either side of the conflict and post-war peace was made on a tribe to state basis. For example the Iroquois were removed from their traditional home in northwestern New York to the Ontario Peninsula after they signed a treaty with the State of New York. Several other treaties between states, the Articles Congress and the tribes began slowly ceding Indian lands westward. Raids continued from the end of the Revolutionary War through the first formal campaign of the conflict, General Josiah Harmar’s 1790 campaign. Harmar’s goal was to punish Shawnee and Miami villages for raids, destroy a large Miami town and replace it with a fort. The ragtag force was comprised largely of replacement immigrants (paid by the militiamen who had been called to duty) who were not used to warfare or life in the frontier. The force found the large town abandoned but was bloodied in several skirmishes over the next week. The Indian victory emboldened the confederacy which stepped up raiding of American settlements. The next year, Washington ordered Arthur St. Clair, governor of the Northwest Territory to lead an offensive against the confederacy. St. Clair ran into similar problems as Harmar with supplies and ill-prepared soldiers. As his force camped near the modern border of Ohio and Indiana, their weak perimeter was overrun by 2,000 confederation warriors and decimated. St. Clair’s Defeat would be the worst defeat in terms of casualties by any American force in the various Indian Wars. A furious and frustrated Washington ordered a third commander, General “Mad” Anthony Wayne to form a professional force and end the untenable situation. In 1792, Wayne took command of a new Legion of the United States. Unlike the ill-prepared militiamen of the previous two campaigns, this force was comprised of professional federal soldiers. Continued confederation raids in 1792 put intense pressure on the scattered American forts on the frontier. An attempt at peace in 1793 failed for a variety of reasons ranging from tribal infighting to a potential lack of legal authority by attending American commissioners. As the peace council failed, Wayne was moving his Legion towards Fort Washington (modern day Cincinnati) and was informed that angry warriors were preparing to attack the legion and vulnerable frontier forts. Instead of pushing on to Fort Washington, Wayne led the Legion north into the heart of Indian territory. He built Fort Greenville in west-central Ohio and utilized this point to fortify and repair the exposed frontier posts. He forced a decisive encounter at the Battle of Fallen Timbers in August of 1794. This battle ended the Indian threat to settlement of Ohio and opened modern Indiana. Wayne finished his campaign by fortifying the Maumee River from modern Fort Wayne, Indiana (named in his honor) to Toledo, Ohio. Indians in Ohio faced the decision of remaining to live a considerably different life amongst the increased presence of American settlers or flee beyond the fortification line. The victory even had international ramifications. Fearing an emboldened push by American settlers into Spanish Louisiana, a treaty was signed between the United States and Spain in 1795 defining North American boundaries and allowing American settlers the right to export goods via New Orleans. Finally satisfied, Washington directed his focus to Indian raids in the Old Southwest and expanding commercial safety along the Great Lakes. In 1796, American forces began moving down the St. Lawrence into the Great Lakes and rebuilding old British and French forts. Before this, only remote Fort Mackinac, located on an isolated island between Lake Michigan and Lake Huron, acted as the only stronghold of American power in the entire region. Over the succeeding decade a series of forts were built around the Great Lakes including Fort Dearborn (modern Chicago), Fort Detroit (modern Detroit), Fort Erie (Buffalo), Fort Toronto (Toronto), Fort Niagara (Youngstown), Fort Frontenac (Frontenac), Fort Kamanastigoya (Kamanastigoya), Fort de Repentigny (Sault Ste. Marie), Fort Miamis (St. Joesph), Fort Ogdenburg (Ogdenburg), Fort Des Sables (Rochester), Fort Le Boeuf (Waterford) and Fort St. Joseph (Tenby Bay). In addition to those Great Lakes forts, efforts were made to secure the western frontier of Quebec by fortifying key locations along the Ottawa River. As Indians were pushed out of Ohio they scattered into modern Indiana, Michigan and Ontario. To prevent reprisals from Ontario into Quebec, fortifications at Fort Ottawa and Fort Coulogne were established and the old French and Hudson Bay Company fort at Fort Temiscamigue was rebuilt. Forts Brule (securing the French River), Clark (securing the eastern shore of Lake Huron) and Lagarre (securing the Grand River) were constructed several years later to facilitate settlement of the Ontario Peninsula. A series of forts were planned for the far shores of Lake Michigan and Lake Superior but this was scrapped as fort building and conflicts over settlement transitioned to interior locations. This campaign of ambitious fort building helped to open up the Great Lakes to American settlement and trade at the end of the 18th century and start of the 19th century. Fort Kamanastigoya, the most isolated fort, played an integral role in defending the Grand Portage and opening up the Nelson River Basin to settlement and trade . Throughout the early 1800’s American settlers and traders would work their way into the northern interior river systems and reestablish old Hudson Bay Company forts and posts. This brings up the issue of the Hudson Bay Company in itself. Established in the 15th century, the Company possessed massive arctic holdings that were immensely rich in furs. The remoteness and harshness of the climate prevented the full scale colonization seen on the North American east coast. Instead, a number of small “factories” (named for the chief administrator or ‘factor’ of the village) were established along the Hudson Bay coast. York Factory became the most prominent of these trading posts. Throughout the winter, Native Americans and European traders would trap animals and trade their pelts at the factories for set prices. Company ships would arrive in the summer, restock the factories and take the pelts back to Europe where they fetched obscene prices. In 1717, Prince of Wales Fort was established near the mouth of the Churchill River to fortify the British presence in the area, countering French trading systems during the great scramble for North America that occurred throughout the 18th Century. For over a century, the Company largely operated on the coast but began creating a rudimentary system of trading posts in the interior river network of North America in 1774. Within a few years the American Revolution had destroyed any long term plans the Company had for the interior of the continent. To the surprise of many, the Company endured for another 30 years beyond the Treaty of Paris, albeit operating exclusively in Britain and via its ships. Americans quickly took control of the old factories along Hudson Bay and a frigid detachment of federal troops occupied Prince of Wales Fort (Renamed Fort Carleton after the war). Trade immediately resumed from Hudson Bay but under a much different apparatus. British ships were accompanied to the far north by French, Spanish, Dutch and Swedish vessels, also interested in the riches of North America. A uniform system of pricing was replaced with chaos that left trappers and Native traders guessing as to which buyer had the best deal. A number of intrepid fortune seekers took up shop in the old factories and made fortunes. Some less than fortunate adventurers made their way up north and were either quickly chased off by the cold or disappeared into the wilderness never to be heard from again. Harsh conditions limited widespread settlement but the typical antagonism between American intruders and Native inhabitants crept northward as well. Violence wasn’t uncommon, though it didn’t rise to the level of the wars seen to the south. Nonetheless, the potential for an Indian war in the interior of North America probably helped to prompt the Great Lakes fort building campaign and the garrisoning of Fort Carleton. It probably helped to spike demand for firearms in the region through the factories. It also helped to prompt one of the Jeffersonian expeditions of discovery, which would chart the deep interior and pave the way for further settlement, and conflict, in the early decades of the 19th century. In our timeline, the 1774 Quebec Act did much to appease rebellious Quebecoise feelings but was a big factor in further angering the English colonists. The English colonists wanted to continue settling west into the Ohio Valley at the expense of Native Americans. The basic idea for the Crown was to give Ohio to Quebec since the French settlers had much better relations with the Native Americans in the region and the protect the region from settlement as an Indian Reserve. In this timeline, the technology given to the Order of Freedom pushes the Quebecoise into the revolution regardless but the royal claim is still on the books. Rupert’s Land was a very ill-defined massive region that was the exclusive property of the Hudson’s Bay Company. Tracing its history back to the explorations of Henry Hudson the claim was given to the Company and encompassed the entirety of the Hudson Bay drainage basin. All that was really known of the land at the time was it was remote, great for trading with natives and for fur trapping but not good for settlement. The land was named for Prince Rupert and made the company super profitable. It wasn’t formally ceded to the Dominion of Canada until well into the 19th century. Maine’s northern boundary was contentious in our timeline as well. It wouldn’t be until the Webster-Ashburn Treaty of 1842 that the issue was formally resolved between the United States and the British. Even then the issue sparked a sloppy skirmish in which two people were injured known as the Arstook War. For the purposes of this timeline, state negotiators reach a deal sooner and follow the similar border we have today that splits the difference between the extreme claims. An in timeline name for the Boundary Waters area of northeastern Minnesota. In our timeline Fort York was renamed Toronto, the original Indian name for the area, after loyalist settlers came to the Ontario Peninsula after the Revolutionary War. In this timeline, there is no Fort York but the harbor and defensible position of the area entice a new fort which is named after the Indian name for the region. The Grand Portage is the name for a relatively short and critical overland route between Lake Superior and the Nelson River Basin. Crossing this 8.5-mile portage allows one to join the Great Lakes and St. Lawrence River with interior Canada. The Nelson River Basin allows access to Lake Winnipeg and from there you can proceed to Hudson Bay or follow the Saskatchewan River deep into Alberta. Oh man, oh man. This is Libertad from AH my man. Incredible. Incredible. A lot has changed in me these few years but I am still a fan of this great work of yours. I am your semi-active (or semi-passive) observer of this work here. This is now favorited for easy access and surfing now. I am not sure why you suddenly stopped posting this version 3 on that site. It’s been 5 months since there is a post there. Don’t you want to reinvigorate that thread with a series of posts coming from here and then see a whole set of commentaries there as it was before. That’s why it’s a pleasant surprise to see this back… though here in this site of yours. I just saw this site through a link you posted back in AH. A lot has changed in the site and a lot has changed in me but my love for the United States of Ameriwank fictional universe continues on. Please come back to us there. Are you very busy right now to do that? I saw that you last updated or commented or probably entered AH back in July. This update is back in July as well. It’s been two months. Life has been making you very busy again as of the moment? Thank you for doing this again and doing this even more beautifully.